Investing In Wide Moat Businesses is a free download from the Manual of Ideas that talks about characteristics of wide moat businesses and how to spot them. I have not finished reading this yet, but I can tell the knowledge inside will be very good. Warren Buffett’s Evolution and His Three Investment Styles is a write-up from http://can-turtles-fly.blogspot.com/ about how Warren Buffett invested in the past and how he invests now, the differences in his thinking and why he has had to change over time. Good read for anyone interested in Buffett. The Theory of Investment Value: Four Enduring Takeaways on Dividend Investing from John Burr Williams is a write-up from the CFA Institute on dividend investing from the perspective of the 1930’s and how the principles still apply today. The Value Gene is an interview of Paul Isaac talking about Walter Schloss, his father Irving Isaac, what he is investing in now, and what he thinks of the overall economy. Activision Joins Game Industry Search For New Ways People Play is an article from Seeking Alpha where the author goes into detail on the declining video game industry. 7 Things Highly Productive People Do is an article from Farnam Street on how you can become more productive. Hope you enjoy the links. Now it is time for me to search for another company to research. L.B. Foster, Incredible chart on investment fees, and Optimizing the Investment Process. Original article from Seeking Alpha here. PITTSBURGH, July 25, 2012 /PRNewswire/ — Pittsburgh, Pennsylvania-based L.B. Foster Company (FSTR) has been awarded the company’s largest rail products contract, valued at approximately $60 million, by contractor Kiewit/Kobayashi, a Joint Venture for the county-wide construction of the Honolulu Authority for Rapid Transportation (HART) passenger transit system. L.B. Foster rail, concrete ties, direct fixation fasteners, third rail with accessories and special trackwork will be installed throughout the Honolulu Rail Transit Project’s new elevated railway system and maintenance yard. L.B. Foster offered a comprehensive materials and logistics package that maximizes purchasing efficiencies and meets critical scheduling requirements for the HART project. “Our company provided the highest quality and value offering, most comprehensive logistics package and the professional project management team necessary to successfully satisfy the requirements of such a large municipal project,” noted Greg Lippard, Vice President of Rail Products Sales at L.B. Foster Company. “Our L.B. Foster team has a long and successful relationship with Kiewit. We have worked closely with this leading contractor to provide quality products for signature projects throughout North America,” said Hakan Eksi, General Manager of L.B. Foster Transit Products. This chart is showing the difference in returns. The Vanguard fund has a 0.05% fee, and the generic mutual fund in the chart has a 1% fee. 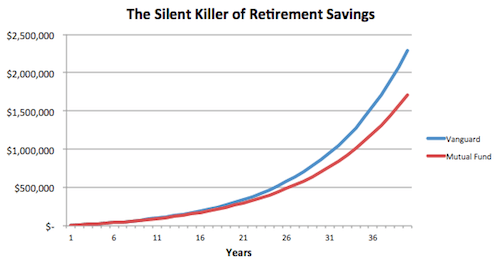 It ends up being a difference of almost $600,000 over the time period. Stated another way, and not even counting inflation, the way he had their funds set up, they had to produce returns of at least 8% a year just to break even. Suffice it to say that I am now running their retirement funds. This is a fantastic and very important article where Michael Mauboussin talks about how it is extremely important to come up with a great investment process and how that can lead to great returns over time. This article also talks about how investment returns, especially short term, can sometimes be misleading. I encourage you to read the whole article at the above link. I thought this article was interesting, mainly because I have never thought of this possibility. The article talks about how Activision Blizzard could buy its own shares back from Vivendi, instead of Vivendi spinning off or selling ATVI to a third-party. It speculates that because Vivendi is having trouble selling Activision, and since ATVI has about $3 billion in cash and almost no debt that they could finance the rest of the transaction. To me this makes zero sense from both companies perspectives. For Vivendi they would most likely not get the premium on the shares that they are looking for, meaning they would not be able to pay down their debt to the levels they would want. For Activision this would mean they would lower their cash hoard, and have to leverage up their balance sheet just to make the transaction happen. Seems like a loser to me on all accounts. I am interested to see if anyone has any differing thoughts on this possibility. Here is an overview of the gaming industry and the profitability of each company. 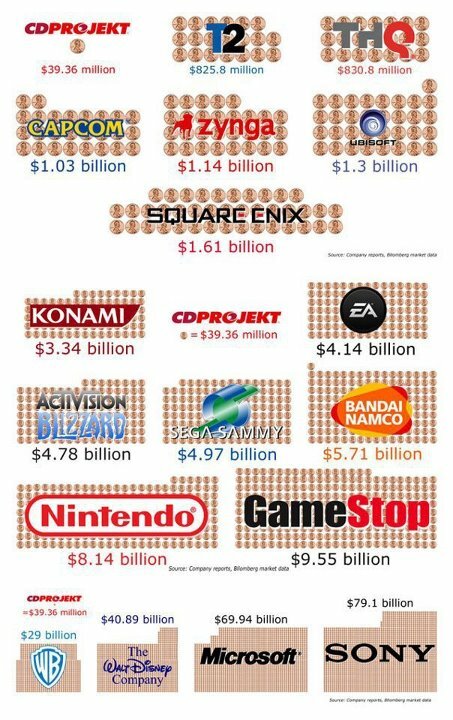 Three things surprised me about this graphic: 1) That Gamestop is making as much money as they are. 2) That ATVI was behind Nintendo, Namco Bandai, Sega, and only slightly ahead of EA in terms of profits. 3) That Zynga is making over $1 billion in profits. Most of their games are free to play on Facebook aren’t they? I do not know much about Zynga, I have never played any of its games, and only heard of a couple of them, so if anyone else has information on them could you please let me know. This article talks about decision making errors that could be hurting your investment performance and talks about five active thinking strategies. Some pretty interesting thoughts.